It is no doubt that Twitter is becoming ever-increasingly popular these days and for all of you Twitter fanatics out there we have found a great tweak just for you. Introducing QuickTweet, a Cydia tweak that will add a small button to the bottom of your Notification Center, allowing you to quickly tweet natively on your iPhone, iPod Touch or iPad. Though this Cydia tweak may not be a complex tweak with numerous configurable options that were usually used to seeing. QuickTweet is a great tweak for those who are active users of Twitter and like the idea of being able to tweet by simply pulling down their Notification Center. 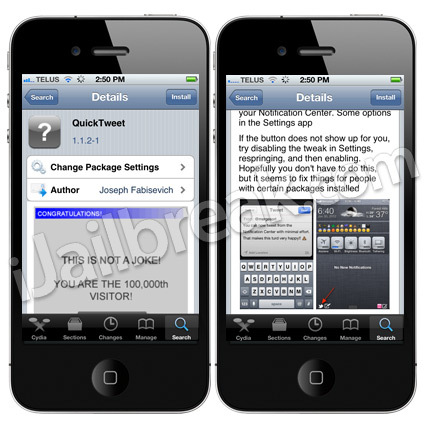 If you are interested in the QuickTweet Cydia tweak you can find it through the BigBoss repo for FREE. Let us know what you think of this tweak in the comments section.